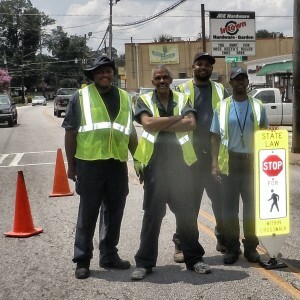 On Sunday October 7th, 2012, Atlanta Streets Alive will return to North Highland Avenue for four hours — from 2pm-6pm. Two miles of North Highland plus one mile of Virginia Avenue plus just about two miles of the brand new Atlanta BeltLine Eastside Trail means we will have almost FIVE miles of car-free community space to ride, walk, play, dance and rock and roll. Look for activities all along the route including local acoustic musicians, a capella groups, marching bands, alongside classes such as salsa dancing, yoga, zumba and thousands of people out riding their bikes. 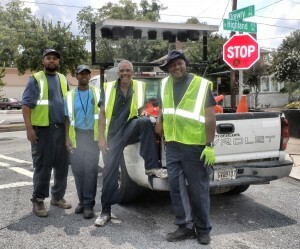 Did you see our hard working City Public Works crew out in the neighborhood June 21? VHCA submitted this list of street repair requests to the City, through the PEDS on-line reporting system on Tuesday June 19. 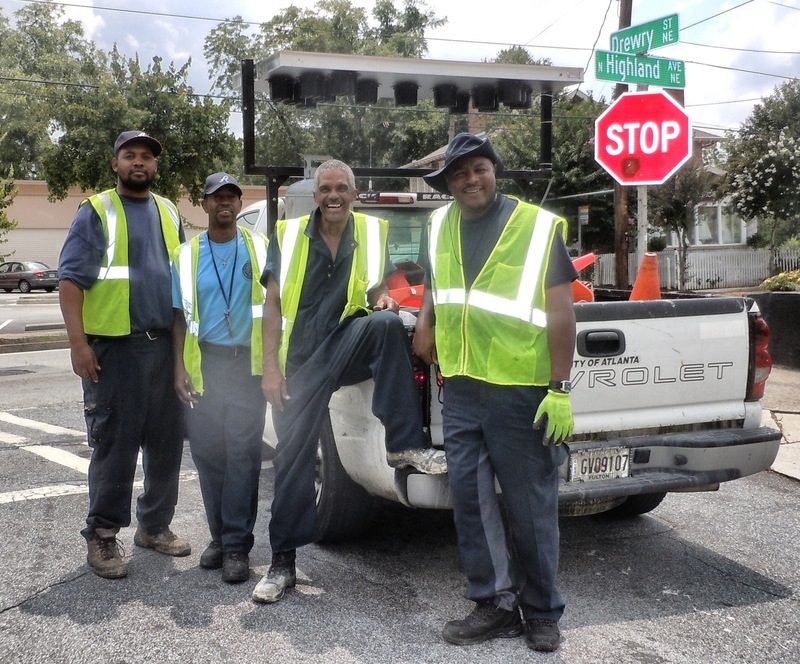 On Thursday June 22, the City had a crew in the neighborhood making the repairs!!! What a great response! City Street Repair Crew installing pedestrian crossing signs - photo courtesy of Jack White. Crosswalks along North Highland in Atkins Park need to be repainted, St. Augustine, St. Charles, St. Louis and Greenwood all need repainting badly in some directions and are in slightly better shape in other directions. Crosswalks at Ponce De Leon and North Highland need painting badly in all directions. We need the stand-up Pedestrian Signs replaced along North Highland and would like to have them anchored to the street. I was told that the street light in front of Yogli Mogli at the corner of Virginia and North Highland needs to be connected (but haven’t been up to the corner after dark to see if this is fixed). Would you install a countdown signal with walk/don’t walk sign for pedestrians at the intersection of Virginia Avenue and Park Drive. This has heavy traffic from the Middle School and no signs, so it is a safety issue. There are two yield signs on Park on the east side of Monroe, turning south. One is in really bad shape, would you take it off the back of the sign to which it is attached, or replace it? The pedestrian signal needs repair at Monroe and Park on the east side of the street. Greencove Ave. needs repaving. It is severely potholed and broken, particularly at the dead-end of the street; a large hole on Clemont where it meets Greencove needs repair. Last edition of the Voice (print edition) published! This is an extremely dangerous street for pedestrian crossing – so please use extreme caution here. The following is a report from Major Calvin Moss of APD Special Operations – “On Wednesday, August 12, Zone 6 responded to an adult male pedestrian struck by a vehicle at Monroe and Dutch Valley Road shortly after 1:00 p.m.. According to witnesses, the pedestrian was crossing Monroe with the signal when a silver Nissan traveling south glanced off another vehicle, struck the pedestrian in the crosswalk and continued through the intersection against the red light. The driver was on the scene and cited for the accident. The pedestrian was transported to Grady Hospital with a badly broken arm and other contusions and abrasions, but his injuries are not believed to be life threatening.” Thanx to Cary Aiken for alerting me to this tragedy and to Major Moss for doing the research to find out the details.